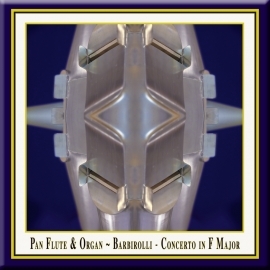 Corelli: Concerto Grosso in G Minor, Op. 6 No. 8 "Christmas Concerto"
Digital Music Album · DDD · 5 Tracks · Duration: 7 Min. 57 Sec. 'Corelli's Legacy' from the K&K Verlagsanstalt label offers Baroque music enthusiasts a listening experience which is unique on several fronts. 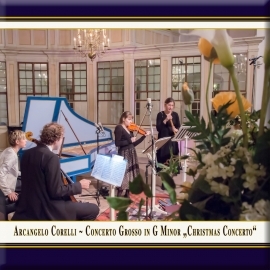 Subtitled 'Baroque Music by Arcangelo Corelli and his "Students"', the album surveys the far-reaching influence this great violinist and composer had on his contemporaries. Aside from works by Corelli and Geminiani, lesser known composers represented are Pietro Castrucci (1679-1752), Giuseppe Valentini (1681-1753), Giovanni Mossi (c.1680-1742), Antonio Maria Montanari (1676-1737) and Gasparo Visconti (1683-1713). The European Union Baroque Orchestra performs under director and violinist Riccardo Minasi. 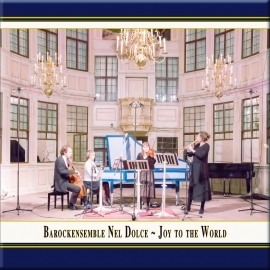 The recording is from a series titled Authentic Classical Concerts. 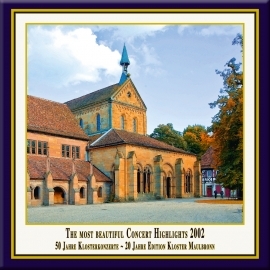 This particular release is part of a series called 'Castle Concerts', the basic concept of which is to capture live concerts in settings where these pieces might first have been heard. In this case, it is the town church in Bad Homburg, Germany which Wilhelm II had turned into one of the most intimate and beautiful concert halls in Europe. The hall was forgotten over time, and has only recently been restored to its original splendor. The European Union Baroque Orchestra is an ephemeral group, with its membership changing every year. The young players are selected from all over Europe, each being a specialist in early music performance. For six months out of the year, they are on tour, giving concerts in interesting and historic venues. The orchestra has performed under the directorship of some of the most eminent early music specialists in the Europe, including Roy Goodman, Ton Koopman, Gottfried von der Goltz and Paul Agnew. This Corelli's Legacy concert was directed by violinist Riccardo Minasi, who also performs. Mr. Minasi has appeared with Europe's leading early music ensembles, including Le Concert des Nations; Concerto Italiano and Il Giardino Armonico. The playing is very fine and the energy of the live performance is palpable. The recording does give a sense of the intimacy of the venue; we are up quite close to the performers. This does results in a little stage noise and you can hear the inhale of the players before they begin playing, but this is just as it would be had you been in attendance. Recommended for the music, performances, engineering and a very unique concept. HD Recording · DDD · Duration: 10 Min. 03 Sec. HD Recording · DDD · Duration: 58 Min. 02 Sec. Wolfgang Amadeus Mozart: Piano Concerto No. 21 in C Major, K. 467 "Elvira Madigan"
& Piano Concerto No. 26 in D Major, K. 537 "Coronation"
Ennio Morricone: "Cockeye's Song" from the movie "Once Upon a Time in America"